These options will be applied to the new records descriptions (text editor will be initialized with these options). Default Font - here you can choose default font for the text editors. Add Background - this options enables background for the documents. Picture - adds a background picture. C-Organizer comes with some background pictures. You can find them in the "...\Interactive Calendar\Backgrounds\" folder. 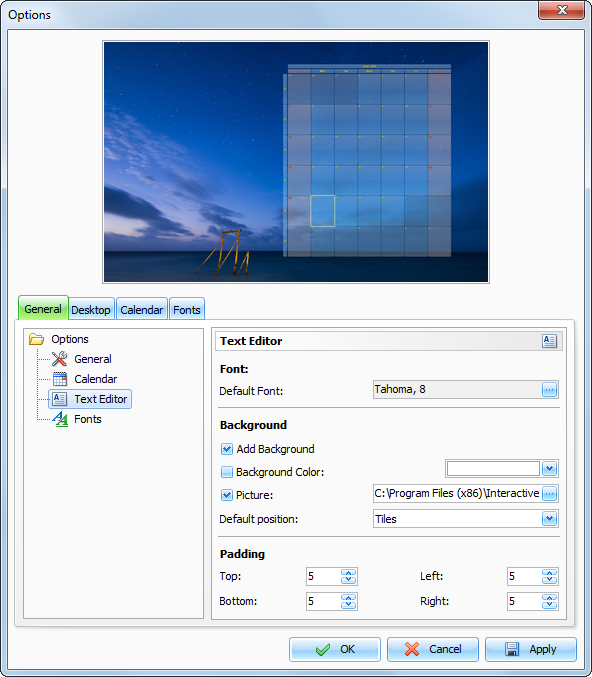 Default position - if the picture is selected, you can set up its position: Tiles, Stretched, Center, Fixed Tiles, Top Left, Top Right, Bottom Left, Bottom Right.